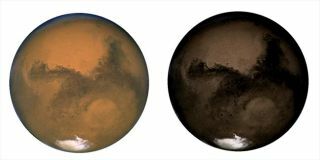 Mars may once have looked more like the image on the right, rather than the current, red version on the left, according to a new theory that uses wind erosion, not water, to give mars its ruddy color in the relatively recent past. Mars was not always red, according to a new theory for how the planet took on its characteristic ruddy hue. "I think it means that Mars wasn't always red,"